Rocking the ailerons isn't under it's own power, it's under yours, and it wouldn't be with the intent of flying without applying the aircraft's engine power. Applying engine power to the drivetrain causes the rotors to turn, which causes the entire aircraft to vibrate as the CGs of the rotor systems oscillate, and under the aircraft's own power. It is moving. It is not at rest. Regulation says moving. Interpretation says taxiing/taking off. The interpretation states moving from the parking spot with the intention of flight. Read the interpretation. It's been provided. Perhaps you've never flown an aircraft that moves its own ailerons, or an aircraft that powers it's ailerons with something other than the pilot, so perhaps you wouldn't know. The example is valid. The rotor is a component of the aircraft. Not the aircraft. A rotor in motion can turn all day, just like a propeller, and unless the aircraft moves, the requirement of the regulation hasn't been met. An aircraft "vibrating" really is irrelevant, and you won't find an iota of support for that in the regulation or the legal interpretation which attends it. Ooooooh, except it's *not* a propeller, is it? Your rotor blades are your WINGS. Without wings you certainly don't have an aircraft, you have a lawn ornament. You have part of an aircraft. Just as one has ailerons as part of an airplane, or flaps, or a propeller or turbofan. Regardless of how you wish to spin it, you've been shown wrong, you've been shown the regulation, you've been shown the position of the FAA Administrator, and you've been provided the text and the links. That's all that matters. You're welcome to lobby to change the regulation. Good luck with that. Well, they're not really "wings", either. They're an airfoil. And if that airfoil happens to be attached to a helicopter and that helicopter is still in it's parking spot on the ground, you ain't flying and you ain't logging time. Edited by helonorth, 27 September 2016 - 08:43. But they are producing lift, and that lift must be controlled! Ever read an accident report where some "pilot" ignored his PIC responsibilities and got out while the blades were still spinning and something went horribly wrong? No its not loggable flight time, but it should still be loggable as at least PIC! If anyone is really that hard up for an extra .1? The fact that Lloyd had to ask the FAA, and that the FAA, in their official interpretation, had to add language with qualifiers that aren't in the definition, means that the definition, by itself, isn't clear to the lay aviator. I've been quite clear that I know what the Lloyd letter states. The only way I know of Lloyd is because I lurked on this site before I got out of the Army and found a similar discussion. I'd be willing to bet most pilots aren't even aware that the Lloyd interpretation exists. It may not matter at all for someone that's been working for a decade, but for the guys struggling to get their first "real" job, it does. Coming from an academic background in engineering, I know intuitively and technically that vibration is movement; I know that, at ground idle, the main and tail rotor rotation causes the whole aircraft to vibrate as the CG oscillations cause the airframe to vibrate. If I were to write the regulation to reflect what I think it ought to be I'd use pretty much the exact same language that the FAA did. I might have to write a letter of interpretation to avbug stating that an aircraft with an APU and hydraulic flight controls doing pre-flight checks doesn't qualify for pilot flight time, and that it would start when the engines are started. Then I might have to change the definition to specify engine power, but that'd be about the only difference. In practice this would result in everyone using oil pressure Hobbs. Except for the glider pilots, of course. If I were to write the regulation with the FAA's intent in mind, I wouldn't use the word 'move' without the qualifier: away from its parking place. Otherwise I'd use the word taxi. I know pilots that don't log flight time on a helideck, which isn't addressed in Lloyd, though Lloyd seems to indicate that pilot time still accrues during interim landings. I do admit that I don't know if there's a letter of interpretation specifically addressing it. Perhaps someone can enlighten us. The best definition of pilot flight time is when the aircraft is not attached to the ground. It works for airplanes, helicopters, gliders, balloons, and Icarus. I don't know why the FAA drew an arbitrary line in the sand that lets airplane guys log flight time when they've got a free hand to finish their coffee, but most helicopter guys don't get to log time until they are in the air. That's probably why a few of us get worked up about it; it just seems unfair, especially since most of us are too poor to fly helicopters for fun so we have to try to get a job doing it. Why would we lobby to change the regulation? The FAA will only change the definition to reflect Lloyd, screwing over all the current and future students and CFIs who log oil pressure Hobbs. The FAA has been consistent in interpreting its "intent" with respect to the rule. 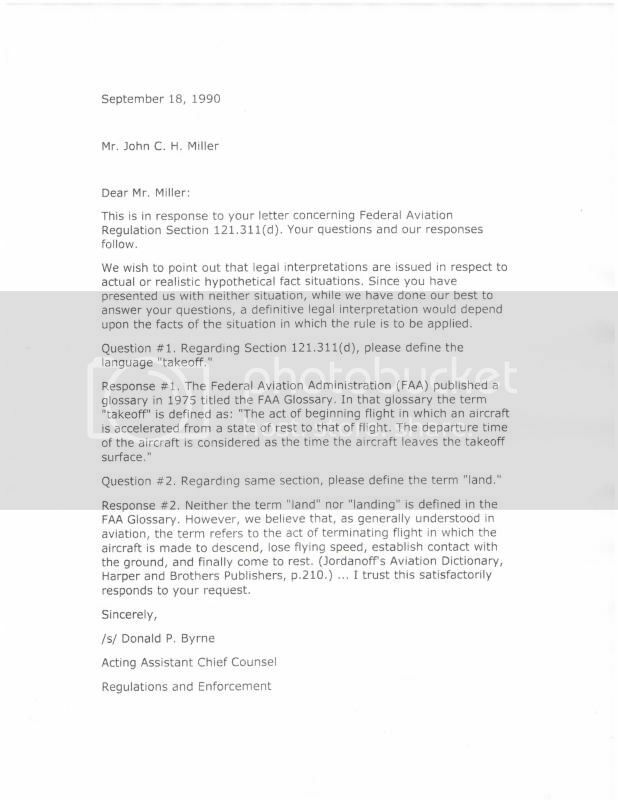 Seventeen years prior to the 2007 Lloyd letter, the FAA address the same take-off and landing issue. Edited by iChris, 27 September 2016 - 15:06. If that's true, Chris, Lloyd changed the start time for pilot flight time to include taxi time, whereas in Miller it began at the start of the takeoff roll, unless 1. Miller's question wasn't related to pilot time, or 2. the wording of the definition in the regulation changed. Edit: Regulation addresses 'seatbacks in upright position' ref: 121 ops. Not related to discussion at hand. Edited by kona4breakfast, 28 September 2016 - 16:47. So, an S-61 taxiing around the tarmac for half the day can be logged as "flight time"? This whole thread is moot! Ohhhhh Helonorth, PLEASE tell me that you are not this dense. PLEASE tell me that you understand that a helicopter rotor is a rotating WING. I refuse to believe that you don't understand this very simple concept! Yes, yes they are wings. But the fact that you're not *flying* is actually beside the point. The reg about logging pilot flight time has nothing to do with *flying. * I'm surprised and disappointed that so many helicopter pilots are still having trouble with this. Airplane pilots, or pilots of any wheeled aircraft who are taxiing for takeoff are not flying either, are they? Of course not. But they're logging pilot flight time. How on earth can that be! It's because there is no requirement for the aircraft to be off the ground for the pilot to be logging time. I know this is difficult for some of you. I know that some of you think that the FAA requires pilots to actually be flying for us to log pilot flight time. But that is just not the case. Yes! Yes, of course...*IF* the intent was to eventually take off and go flying. And actually, let me edit this to add something. If an S-61 taxied around for two hours, and then lifted off into a hover and set back down, ALL of that time would be considered pilot flight time. The aircraft however would only log .1 or so on its components (engines, rotors, transmission, gearboxes, etc. ), depending on the length of the hover. Yes, it can, if you're doing it with the intent of flight. Just the same as a cross country trip of 50 miles in which one spends five hours holding at the mid point, is still five+ hours of cross country. OAirplane pilots, or pilots of any wheeled aircraft who are taxiing for takeoff are not flying either, are they? Of course not. But they're logging pilot flight time. How on earth can that be! It's because there is no requirement for the aircraft to be off the ground for the pilot to be logging time. No, there isn't a requirement for the aircraft to be off the ground, and the same regulation which entitles a fixed wing pilot to log flight time once the aircraft has moved with the intention of flight also allows the helicopter pilot to do the same. The fixed wing pilot can't start engines and simply start logging the time as he sits in the blocks, either. Go figure. “The act of beginning flight in which an aircraft is accelerated from a state of rest to that of flight. The departure time of the aircraft is considered as the time the aircraft leaves the takeoff surface." So it is with a number of pilots who debate the meaning of the word “move” with respect to the aircraft moving under its own power. They misunderstand the main basis of the legal standing. In this case, legal standing is with the intent of the rule. Any definitive legal Interpretation depends upon the facts of the situation in which the rule is to be applied. As applied by the FAA, flight time was never intended to be applied to an aircraft sitting on the ground with the engine running and rotor blades turning; wherein, the aircraft has not moved from its parking place and flight has not yet commenced. This is really not moot, since there’s no uncertainty and a final decision has already been made. Bottom line is, you have full control over your logbook. If ever confronted by any FAA representative of the Administrator, at least you know the official line to reply with. subject to debate, dispute, or uncertainty, and typically not admitting of a final decision. Edited by iChris, 28 September 2016 - 00:26. I see no relevance in what we term a rotor blade. You can call it an "anti-gravity device" if you want. Makes no difference. I allowed myself to get lured into more pedantic stupidity (a"vibrating" helicopter is a moving helicopter which equals flight time, etc.). There really is nothing left to say. The FAA has made it clear what they consider flight time in a helicopter. Feel free to disagree but the reg and the clarification make perfect sense to me. So until the next time you drag this up, I'm out. I hope I don't allow myself to get trolled into this again but I probably said that last time. You didn't read far enough. This seems to be the preferred definition in the US. Edited by helonorth, 28 September 2016 - 14:21. No, we all understand this. No one has stated otherwise. It was discussed at length days ago. That this is a point of confusion or contention exists only in your mind. Now I'm out. Kania is really interesting Chris. Thanks for posting it. It's fairly obvious reading it that the intent behind "pilot time" isn't to log 'flight time' but something along the lines of 'flight duty time.' The FAA interpretation of "purpose of flight" is extremely broad. Airliner taxis from parking to the taxiway, shuts down for 20 minutes to have deicing fluid applied. Logs pilot time. Helicopter pilot runs up, performs power assurance check on the ground just below HIGE power, then has 10 minute wait for SVFR clearance. Doesn't log pilot time. The intent of the letter is to address the specific questions asked by the submitter. "The intention of flight" is very clear. Logging time is the least concern. Flight and duty regulations are a concern in that case, and the time credited toward pay guarantees is a chief concern. In an airline environment, logging flight time isn't really a big deal, save to show currency (which is tracked with the company). Not if it doesn't move with the intent of flight, as already well defined in the regulation and legal interpretations. …helicopter is still in it's parking spot on the ground, you ain't flying and you ain't logging time. This indicates to us that Helonorth still thinks that a pilot must be “flying” (I.E. in the air) to log pilot flight time. And we’ve already proven that this is definitely *not* the case. So when I called him on that, he said, THAT’S NOT WHAT I SAID! Which of course is what he said. We know that the FAA defines aircraft flight time as “wheels-up to wheels-down” (or skids-up to skids-down). The *aircraft* is not flying if the landing gear is on the ground. But they allow pilots to log *MORE* than that as “pilot flight time” as long as certain parameters are met. A fixed-wing pilot could taxi out for takeoff, find a maintenance problem and then taxi back in to have it fixed. *ALL* of that time would be considered “pilot flight time.” Even though he did not actually takeoff, he was taxiing with the intent of flight. People have thrown in all sorts of irrelevant and complicating items to cloud the issue. The bottom-line is that you do not have to actually be in the air to log pilot flight time. But lots of helicopter pilots think it’s cheating. The only “arguable” or “debatable” issue here is very simple: I believe that when a helicopter rotor is in motion (e.g. moving), the whole aircraft can be said to be moving. Yes, I know and understand that the FAA has issued an opinion letter to the opposite, and yes I know that the wording in the actual rule is vague (debatable?). I believe the current interpretation is wrong. Perhaps whoever the new head of the FAA’s Legal Department is might have a different opinion? Let’s find out! Remember, Becky and Viola’s “opinion” is not carved in stone. Nor does it constitute case law. A helicopter rotor is *not* analogous to a propeller…or an aileron (Jesus, Avbug). The helicopter rotor is an airframe part and, when you consider the whole disk, the biggest airframe part! We have full aerodynamic control over the blades even at “ground idle” or whatever setting you use. Words matter. I don’t know why the original writers of the Definitions section (FAR 1.1) didn’t use the phrase, “taxis under its own power.” I don’t know why they used the word, “moves.” Were they being clever? Or did they just not care? I suspect the former.